I bought these for my wife for a Christmas gift this year. She loves the aviator look and wanted something a bit different. They look awesome, they are very sturdy, and they give a cool vibe. The blue lens is really hip, and ther frame seems like it will really hold up. She loved them. Would highly recommend them for anyone looking for this style, but wanting something a bit different. Classic yet contemporary, these Ray-Bans aviators never go out of style. 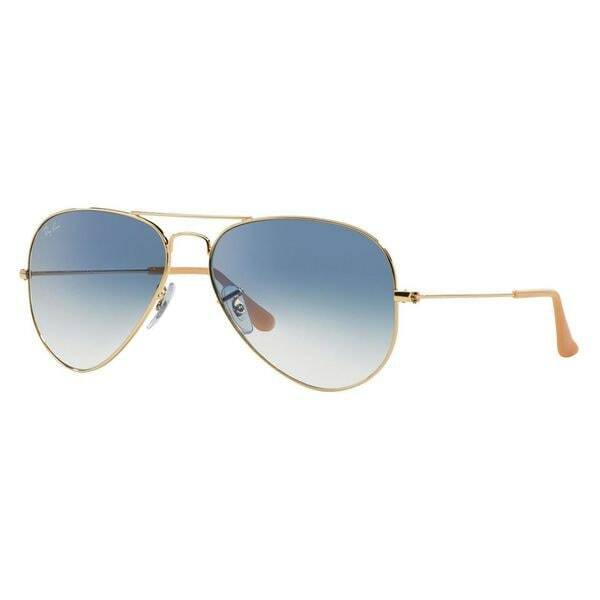 With goldtone metal frames and light blue gradient lenses, these sleek sunglasses are UV protected. Fell in love upon meeting...as a petite woman with an oval face, who has always had problems finding sunglasses that fit my face, these fit my face perfectly at the nose and ears, no pressure at either location...received lots of compliments...Great Choice!!! This is my second pair of Ray Ban Aviators I've purchased from Overstock. These are authentic and have the etching on the lens glass. The Ray Ban case and lens cleaning cloth is included in the package. Now I know why these are the glasses that the stars wear. The are light weight and you don't even know they are on. I love them. Buy them you'll love them. Got the best price on Overstock. Product was as described and is an excellent fit for a small face. Gold color frame stands out and the combination with the blue lenses is perfect. They were perfect. I have a small face, and it is very difficult to find aviators that fit my face. These are perfect. Also they were less expensive at Overstock, compared to other stores. Great pair of glasses and great price. I love Ray-Bans and own a few pair. I have these exact glasses with a silver frame but have been looking at the gold frames for a while and decided to finally purchase. I’m glad i did, i love them! Very lightweight, which is exactly what I was looking for. My other glasses were so heavy on my nose that sometimes I couldn’t wear them because they would trigger my migraines (yes I’m that sensitive) but I actually forget that I’m wearing these because they are so light, I wasn’t sure about the available style at first but I absolutely LOVE these! And I love the color too! Glad I took the chance and ordered them! Okay, so at first I was not a fan of these. I thought they felt cheep,but as I spent the day with them I started to love them. They are very light and actually perfect size! I got the smallest lens ..I have a smaller face as some glasses are just to big. These fit and I give them an a+ thanks Overstock ! Perfect unisex sun glasses. The glasses fit perfectly on my face. My husband also tried them and they would work for him as well. The lenses are a light blue color, however, offer enough coverage to support my migraines. I have had quite a few pairs of Ray-Ban Aviator sunglasses. They look very fashionable. And most of all, it is very comfortable to wear them on a daily basis. Perfectly petite in size, LOVE these! Wouldn’t change a thing. These are my favorite sunglasses on the planet. Not only do they look amazing, they are totally clear at the bottom so as you are using your phone/texting, you can glance down without having to remove you shades to read. Love these sunglasses! The tint is perfect for summer and has a nice ombre effect. I will say that wire rayban sunglasses as SO delicate so be careful with these. My dog sat on them and they smooshed :( I was able to bend them mostly back to shape. Beautiful pair of sunglasses, exactly as described and is authentic. They are the perfect sunglasses for the spring or summer. Looks very good on a round face. Not what I expected, but that is my taste, it may not be that for you. "Are the words “aviator large metal“ printed on the frame in the size 58mm? " "I would like these in the silver frame. Do you have that? Thank you"
You may enjoy item# 20963624. "I noticed that it says that the frame is metal, but the material is plastic. But other sunglasses listed on this site are metal, is there anything different from these and the ones listed on the ray ban website?" The frames are metal and the lenses plastic. "Are ray ban sunglasses on this site authentic? " Please be assured that this item is completely authentic. Hello Laura S., these lenses are not polarized they are a light blue gradient lens. Thank you for shopping with us. Men's Sunglasses Buying Guide from Overstock.com. Our guides provide customers with information about men's sunglasses. Stocking stuffers are proof that good things come in small packages. Show the women in your life that you care with thoughtful stocking stuffers. Look for gifts tailored to their interests or hobbies to evoke feelings of love this Christmas. Whether this is your first Christmas as a couple or you’ve been together for years, the holiday season is your opportunity to show your girlfriend how you feel about her with the perfect gift. If you’ve been wondering what to get her for Christmas to really make an impression, these Christmas gifts for girlfriends are sure to be a hit. There's something personal and fun about the smaller gifts found in a Christmas stocking. Check out our stocking stuffer ideas for every man on your list. If you've been wondering what to get your girlfriend for Christmas to really make an impression, these top 10 Christmas gifts for girlfriends are sure to be a hit. Here's how to tell if a pair of Oakley sunglasses are authentic. Shop our huge selection of Oakley sunglasses at Overstock.com. Top 5 Features to Look for in Sunglasses from Overstock.com. Find the right pair of sunglasses to protect your eyes with these tips. How to Tell If Oakley Sunglasses Are Authentic from Overstock.com. Oakleys are some of the most highly copied sunglasses. Here's how to make sure you have the real deal. Tips on Buying Ray-Ban Sunglasses from Overstock.com. Our guides provide customers with tips on buying Ray-Ban sunglasses.